Our unique flooring is economical, safer, offers improved resale value, and is efficient. 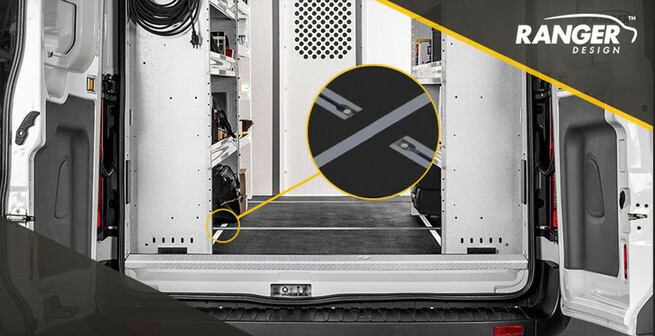 The unique flooring system we offer with integrated aluminum mounting tracks provide a flush surface, making it easy to install a variety of shelving, equipment and accessories. 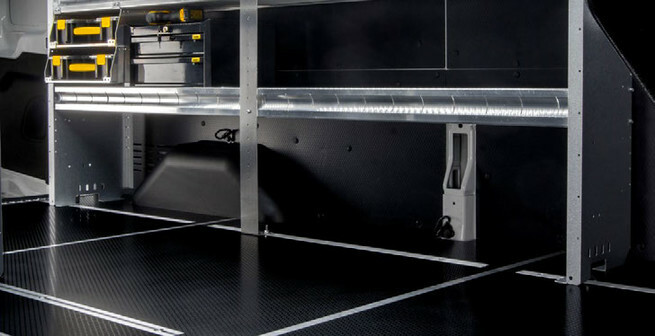 The custom-fit rigid flooring system is available for every type of service van. 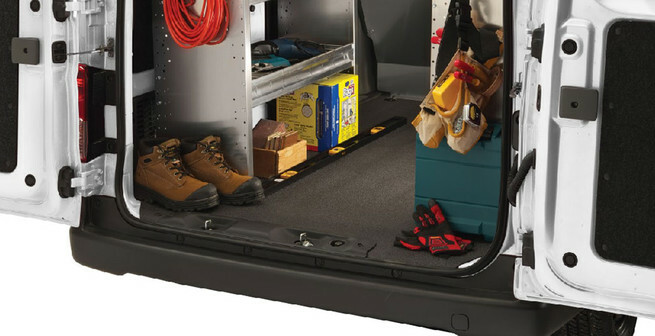 Designed to provide added safety and a quieter ride, these impact and puncture-resistant floors give your van a professional look. • Economical – because the flooring has integrated mounting tracks for the price of a regular floor. • Safer - due to the integrated track, improved load distribution and noise reduction. 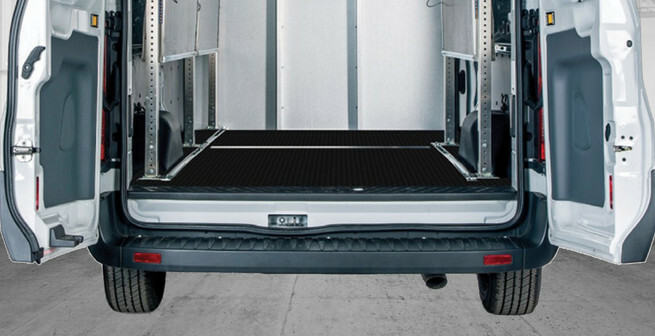 • Improved van resale value – durable professional looking and protects the vehicle. • Efficient – 3 panel floor installed quickly by one person and is easy to maintain. Well I had a sunroof put in my 2018 Ford Explorer and it looks better than a factory roof!The installer Jeff did a super job! This is my 3rd or 4th from these guys and is absolutely the best on of all! My goodness, I never new about ATD and I live only 20 miles away. Now after having auxiliary lights and Cruise control placed into my van, I will never go anywhere else with my 2018 Ford Transit. Best place to go for work! They did a great job putting a new headliner in my '08 GTI, and the price was great too! The best place to go for any custom work. The absolute best place to get your custom work done on your car or truck! I will be going back! Dan was super supportive. He walked me through the installation. Tomorrow his team installs new leather interior..a front and rear camera..and custom interior lights. I guarantee that you will NOT be let down!!! I took 3 of my vehicles to Attention to Detail in Middletown, CT after I had learned that they service over 100+ dealerships in the state (Chevy, Ford, Honda, etc.) utilize them for aftermarket upgrades, such as leather seats, sunroofs, heated seats, etc. They install custom upgrades on new or used vehicles throughout the state. The team here is BEYOND top notch, and better than any OEM upgrades you can expect directly from the manufacture. The thing that really put me over the top was that on the 3rd vehicle I took to them for leather seats, which I must say is AMAZING and included all head rests, door trim, third row, and consoles, they found my wedding band that I had lost two months ago, on the floor under the seat. Unlike many other dealers/installers who may have kept the ring out of dishonesty, they returned it to me when I went to pick up the car. This ring was invaluable as my wife had placed it on my finger at our wedding. The ring had more sentimental value to me than any amount of money that I spent on all three vehicles combined. I am so grateful for such an honest and thorough team at Attention to Detail!!!! I promise you, whether it’s a moon roof, leather seats, mud flaps, car audio, camera systems, entertainment systems, truck bed tonneau covers, led lights installation, heated seats, nerf bars, brush guards, etc. I have had all of it installed by Attention to Detail, between my 3 vehicles, and all of their installations are so AMAZING, at a fair price, and the quality and perfection is indescribable! Randy and Darren were very helpful in getting me what I needed. Thanks guys. The team here has a commitment to excellence and will work to achieve 100% customer satisfaction. I recently had a car starter installed and they ensured that the installed equipment met my expectations. I wasn’t clear in which equipment I needed and they made sure I got exactly what I wanted. I would encourage anyone considering an add on to their vehicle to check out ATD. A local shop of professionals that stand behind their workmanship 1000%. Thanks for everything you did for me! Thanks for the Paint Protection! I have been using these guys for years, they are the best! I HIGHLY RECOMMEND THIS SHOP. This shop is very good and professional..I brought my 2012 Subaru STi in for a new head unit and back up camera and just couldn't be more pleased . They took exceptional care of my new STi. These guys really do pay "attention to detail" . All parts of the install process were explained to me clearly , their service is great and the prices are excellent !!!!! I HIGHLY RECOMMEND THIS SHOP. This place stands by their products and services! These Guys are great, Very professional and thorough. Affordable, and great warranties. These guys go above and beyond! We were very happy with the service we received from Dan Lewis at Attention to Detail. He went above and beyond to solve the problem with our car starter. Would highly recommend them! They brought my Subaru to another level! They have a lot of inventory in stock to choose from, and they also can customize what you need quickly. These guys really know the products they install; and they are passionate about what they do. They are trustworthy, friendly and easy to work with. Dan gave me a couple options on what I could do with my car audio and gave me a couple different price quotes to work with. I highly recommend them; not your typical sales people; no pressure to buy. Bring your business to these guys; you won't be disappointed. These guys helped when nobody else could! Not losing faith in government but definitely losing faith in Westbrook Honda who told me my radio was dead and needed to be replaced for a mere $2,500. That is nuts ðŸ¥œ! Had heard about attention to detail and decided to go there and see what a replacement radio will cost. Representative was very helpful and took my supposedly dead radio and sent it to California to be evaluated and find out if it can be repaired. After 5 weeks radio was returned and was NOT broken at all..., just a blown fuse in the car! So attention to detail replaced fuse, reinstalled radio and charged me nothing. Awesome service and stand up business - recommend! Best place for car electronics hands down! If you need any electronic device installed in your vehicle, this is the place to go. These guys know how to do Marine Audio the right way! I have a 2001 Formula. I recently brought my boat into ATD for a new stereo system and I couldn't be more than impressed with the out come of the work they did on my boat. I had 2 JL amps, 2 USB charging ports, 8 speakers, 2 outside controls (volume, source, channel) JL audio head unit. The day I picked my boat up (I am not electronically savy) so he showed me how to use everything which I was so thankful for. Once I got down the river I was unable to get the head unit to switch source so I called Dan to ask him if there was a special trick. I was unable to still get the source to change so Dan insisted to meet us at the next launch. He hopped right on the boat and some how the source button got stuck so he popped it out and everything was working awesome again. I was really impressed that he insisted to come out there to see what the issue was. (It was clearly an operator error lol). Dan stands behind his work 110%. He was thankful as well that I called him right away to let him know we had an issue so he can share the info with the company if the problem continued or if another customer has the same issue he can provide outstanding customer service to them as well. Thank you again for the amazing customer service I will for sure refer friends and family to ATD. I look forward to doing business with you again. Best place to go for car accessories! I had an all around great experience here. Randy was super helpful. He listened to all questions & concerns. I would highly recommend getting any accessories for your vehicle from here. Everything comes out looking like it was done in the factory. Will be using them for all future car/truck needs. Hyundai sent my 2016 Tucson there to have a sun roof put in came Back, it's awesome I love li they did a great job !!!! Thanks for installing my leather seats! Had leather installed. Fast and quick, drop off in the am and pick up in the afternoon. The only thing I'm bummed about is that the leather is not smooth (my fault) . Definitely trust these guys though, looking for additional work and know where I'll go! Thanks! These guys are true professionals! Great service and installations. Technicians, installers and sales staff are very helpful and do excellent work. They put the customer First! Great Products & Service. Randy has always helped in any way to put the customer First! The best in CT for car add on's! Great place for your car accessories. Staff is very friendly and knowledgeable. I had 3 cars set up with a car starter and each time they did an excellent job. Got a remote starter installed a couple days ago and the installation is excellent. There are no signs of any interior panels being removed and installed. Everything works great, and the unit they installed has excellent range. I will be getting my windows tinted soon and I won't go anywhere but ATD. Top notch quality workmanship. Gift of Remote starting system installed, clean, neat, and efficient. Easy access area and plenty of parking. Pleasant and experienced staff. Excellent and knowledgeable staff. Customer service is unparalleled. They installed a remote starter and added a turbo cool feature for good measure. When I ran into some problems they gave me an additional remote and updated the system at no extra cost. Genuinely good people. They are on time and never disappoint us or our clients! We love Attention To Detail at Valenti Ford and The Valenti Family of Dealerships in Mystic, CT Westerly, RI and Old Saybrook, CT. We use them for leather, Navigation, and remote start installs all the time. They are on time and never disappoint us or our clients! Definitely Recommend. They are the best. A great example for all businesses to follow. These guys are the best hands down. Awesome , clean work. Great products and great people. I've had 3 personal vehicles customized here. Everything is always done perfect. Definitely 2 thumbs up. I love my leather seats they color matched so everything flows! Extremely helpful in getting things done to my liking! I had my seat repaired after the leather ripped in the seam. Hands down best job ever and very professional. I definitely would go back. 5 stars all the way! I go there and see my main man Randy!!!! They do the best work!!!! This place makes you feel like you matter! Had remote starter installed 7 years ago. It recently started acting up. Brought the vehicle back and starter was fixed on the spot. GREAT service! I would not go anywhere else for window tints in CT! Best quality products and service in the state hands down. Always come here and get great knowledgable service. Been going to ATD for years, hand down best products, service and prices. Before you go anywhere else check out this place. There's a reason they've been around forever. Amazing Work!!!!!! Thanks Attention to Detail!!!! Don’t go anywhere else! I’m thrilled with my new leather seats! Beautiful work! Randy was so amazing helping me pick the best color! Many thanks! Dan walked me though the entire system before they installed anything , they had all work done very quickly and everything was super clean and put together well , I'm very impressed with the workmanship. I've had multiple vehicles done here over the years and have always sent friend and family here. Great service and quality work always! Great service with reasonable prices. Replaced the radio in my Honda Pilot that had failed. So glad I came here! I highly recommend them ! Thank you for the amazing job on my spoiler! It’s beautiful!! I took my Jeep there to have a new stereo installed and left with a back up camera and heated seats too. They were very professional and I am thrilled with how the stereo sounds and the heated seats too. Getting ready to have work done on my Audi next! Came out better than I expected! I want to thank ATD for doing a great job installing leather seats on my 16 Honda Accord Sport! Good price and awesome costumer service! I recommend everyone to try ATD for leather seats, alarm systems and more. Always helping me out and going above and beyond for me. These guys have done me right time and time again and they do phenomenal work and it's very very clean. All of my car audio work will be done here as they have great staff and a friendly environment and they always make ppl feel welcome with such respect and honesty. ©2019 Attention To Detail. All rights reserved. Proudly serving individuals and car dealerships throughout central Connecticut communities, including Middletown, Berlin, North Haven, Meriden, Cromwell, Rocky Hill, Haddam, South Windsor, Avon, Manchester, New Haven, East Hartford, Hartford, Manchester, and all of Connecticut.